Antony Gormley's surreal Inside Australia, Lake Ballard, WA (photo: Elise Hassey). The outback can be a delightfully weird and wonderful place. 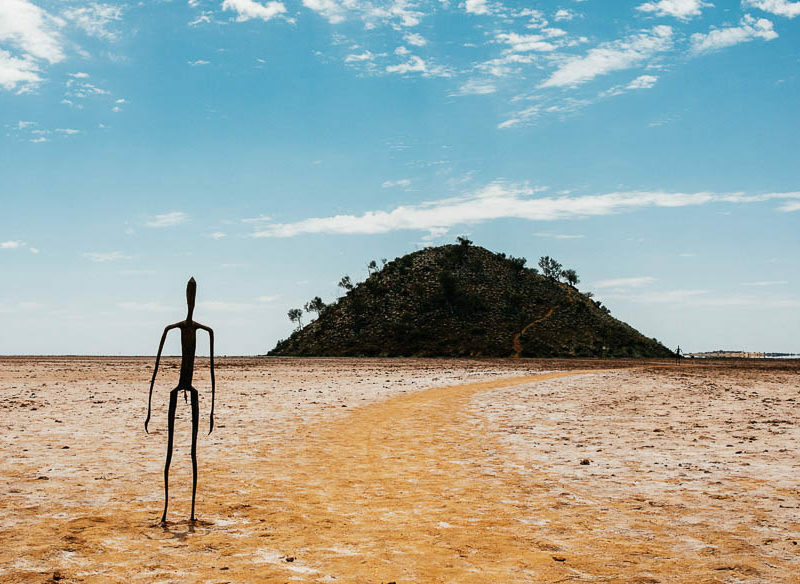 Made all the weirder and wonder-fuller by these 5 remote outback art installations and sculptures. Check out where you need to head if you want to see some of the most impressive outdoor artworks you’re ever likely to see in your lifetime… and they’re all Down Under. Solar-powered sensation; a walk through Uluru’s Field of Light. As far as outback art installations go it’s hard to beat the Field of Light at Uluru on so many levels: scale, originality, setting et al. It’s not the first time that British artist Bruce Munro has installed a light show like this one; he’s been illuminating sundry rural and urban settings in the UK and the USA for years now. But the artist himself admits that this setting, just outside the border of Uluru-Kata Tjuta National Park with its superb ‘rock’ vista, is his grandest canvas yet. He even credits a visit to the Northern Territory back in 1992 with changing his artistic life. The 49,000-square-metre installation, featuring 50,000 frosted LED light bulbs, are solar powered, connected by almost 400 kilometres of fibre optic cables, installed with the help of a volunteer army. The show begins: Dusk at Filed of Light, Uluru. There is a bush tucker dinner viewing option that ups the Field of Light experience a notch or two. For more: Does the Field of Light outshine Uluru? As blank canvases go, there are few better than a flat-as-a-tack outback salt lake such as WA’s Lake Ballard. So thought Turner-prize winning artist Antony Gormley, creator of the renowned Angel of the North, a 20-metre tall, 54-metre wide metal sculpture next to a UK motorway (near Newcastle). Gormley installed the 51 human-shaped metal figures collectively known as Inside Australia on the lake in 2003 for the Perth International Arts Festival. Each one of Antony Gormley’s Inside Australia sculptures was modelled off people from the town of Menzies (photo: Elise Hassey). The figures, set out over a 10-kilometre path, were each modelled on real-life people from the nearby town of Menzies, a former gold-rush boom town (now with a population that teeters between 50 and 60). 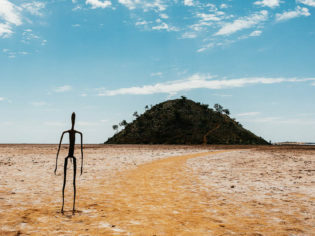 The dark elongated figures set against the mirrored white salt lake can be accessed by car via a red-earth unsealed road and can be walked around in three to four hours (bring plenty of water and sun protection). While the description of ‘modern Stonehenge’ may be a little over the top, the 12 sculptures on a hill 10 kilometres north of character-filled outback capital Broken Hill are certainly worth the detour. Sunset Mecca: The Living Desert Reserve just 10 kilometres shy of Broken Hill. The work, unveiled back in 1993, was completed by an assembly of both local and international artists from as far afield as Mexico. The small-car-sized abstract sandstone works are diverse, and encompass Tiwi totems from Bathurst Island and ‘Bajo El Sol Jaguar’ (Under Jaguar Sun) by Mexican sculptor Antonio Nava Tirado. Part of the installation’s charm is its setting: the highest vantage point in the area, an immense space perfect for that hilltop sunset moment, all without strolling off the little walking trail. The park is surrounded by a wildlife sanctuary so keep your eyes peeled for kangaroos on the dusky drive back to the Hill. A sculpture explosion: Mutonia Sculpture Park, Oodnadatta Track (photo: Jonathan Cami). It’s a genuine rub-the-eyes-with-both-hands moment as you crest a slight rise about 30 kilometres west of Marree, as you bounce along the wilds of the Oodnadatta Track towards the Top End. First, you’ll see two silver Beechcraft planes standing upright out of the parched landscape, wing to wing (‘Plane Henge’), like an outback angle. Fear not, you are not hallucinating – you have reached the Mutonia Sculpture Park. ‘Plane-henge’ – Mutonia Sculpture Park, Oodnadatta Track (photo: Jonathan Cami). If you are heading west, from the William Creek side, you’ll run into a giant dingo first, its head fashioned from an old car; referred to in classic Australian understatement as ‘The Big Dog’. Other works in this surreal-scape include Looney Tunes-esque bombs and robots, all fashioned from recycled industrial waste by former mechanic Robin Cooke. There’s a small contribution plate which helps with the park’s upkeep. Cooke comes back to the former railway siding every year to add to his collection, which began in 1997. Tennis anyone? Tin Horse Highway, Western Australia (photo: Elise Hassey). Arguably not in the same artistic league as the above-mentioned, the Tin Horse Highway, in WA’s Eastern Wheatbelt, is collectively the most ‘Australian’ of this bunch. What originally began as a small promo for the Kulin Bush Races in the mid-90s has turned into a 20-kilometre stretch of road filled with around 60 tin horse in-jokes, each reflecting the particular farmer-artist’s personality. Wheelie? Yes, a motorcycle riding equine, Tin Horse Highway, Western Australia (photo: Elise Hassey). The sculptures are in-situ all year round, but are refreshed in the lead up to the October races. The works vary wildly in form and quality, depicting everything from tennis-playing to motorbike-wheelie-ing equines. You’ll find galleries of rock paintings made between 15,000 and 30,000 years ago on the sandstone escarpments around Laura on Queensland’s Cape York peninsula. Quinkan Country has been listed as one of the top 10 rock-art sites in the world by UNESCO, and provides an incredible visual record of age-old Aboriginal integration with the landscape. Take a tour with the Quinkan & Regional Cultural Centre.